Green beauty products for men are still a little limited in comparison to what's available on the mass market, but I've come across a few great gifts this year to spoil the men in your life! I hope this will give you some inspiration for this year's gifts! If it's ideas for her you're looking for, you can check out my previous blog post, but for now let's get on to those Christmas gift ideas for him! Green People are a fail-safe brand when it comes to products for men! This set contains a refreshing duo of Orange Peel & Clove Body Wash and Peppermint & Eucalyptus Body Wash. I love this limited edition design which is inspired by woodland animals and it's great to hear that 30p from each gift pack sold goes to The Woodland Trust. I'm tempted to pick one of these up as a gift for my other half! Another go-to brand for the men in my household is Lavera. This set would be ideal for the clean shaven guys as it includes Shaving Foam and After Shave Balm. The shaving foam is fragrance-free so it's suitable for sensitive skin and the after shave balm is said to have a calming effect to help prevent redness after shaving. This mini trial-size selection would be perfect for those skincare conscious men and for travelling too. Included is the Cedarwood, Juniper & Pine Body Oil, Shaving Soap, Aftershave Oil and Men's Facial Moisturiser. The 100% natural ingredients couldn't get much better and the simple black glass packaging adds that masculine, luxurious look! Neal's Yard Remedies are really well known for their organic health and beauty products and they're one of only a few natural brands that have physical stores where you can buy the products in person! This collection contains Close Shave Cream (50ml), Calming Aftershave Balm (100ml) and Invigorating Body Wash (200ml) packaged inside an eco-friendly gift box printed with vegetable-based inks. More skincare products in this gift set, featuring two of Weleda's popular products for men. The Intensive Cream sounds like it would be a great product to have to protect the skin from winter weather and to combat dry skin and the Men's Shaving Cream has soothing properties to soften the skin and help reduce post-shave irritation. This has to be one of my favourite gift ideas on the list! My other half uses the beard oil from this brand and always comments how well it prevents irritation and really softens the hair too. This all-natural, 100% organic grooming set includes Good Day Organics Beard Oil, Shaving Oil and Moisturiser, packaged inside a reusable handmade gift box made from ethically sourced pine. Look out for budget friendly gifts and stocking filler ideas coming soon! 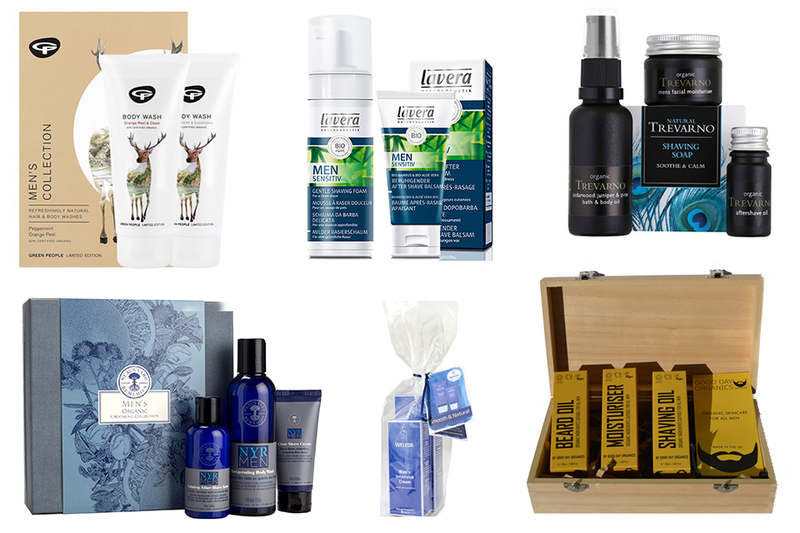 Great gift ideas, I love the look of the Neal's Yard box. Some really lovely gifts here. I came across Good Day Organics brand at the vegan festival, they seem like a great brand. Haven't heard of Trevarno before but I will definitely check them out now.